Few places have profited from the craft spirit boom like the colonial Mexican city of Oaxaca, whose mezcalerias have become must-visit destinations for a growing number of spirit lovers drawn by a sense of adventure, writes Tess Rose Lampert. In the last three years, Oaxaca has transformed from an under-the-radar foodie haven into the hottest craft spirit destination in North America. The changing landscape has brought an invasion of foreigners to populate the mezcalerias, or mezcal bars. This influx of adventurous visitors has spurred the opening of a new bar what seems like every month, each more modern than the last. For those after a more traditional experience, this can still be found at veteran bars that have been pouring mezcal long before it was an international sensation. Traditionally, mezcalerias are small, unadorned spaces that could easily be confused with a cafe in the final stages before a soft opening. The raw decor, often featuring a dried flowering maguey stalk and old glass jugs, offers a special charm in its simplicity, as if the space could be from any time period. Other essentials include a wide variety of mezcals – the more obscure the better – and a small menu of other drinks and snacks (not meals). The most important aspect of classic mezcalerias is a person tending bar that can tell you, in depth, about all of their offerings. These humble Oaxacan outposts are houses of education, transmitted one copita at a time. Many of the newcomers exchange authenticity for mainstream appeal in an effort to attract young and affluent out-of-owners. Live music takes the focus off of candid conversations about harvest and agave age, and places it on enjoying the sociable high you get from drinking good mezcal. The spaces are sleek and expansive, drawing in passers-by from the street. These hybrid westernised mezcal bars have persuaded successful bartenders from cities like Los Angeles and New York to quit their high-level jobs in favour of a simpler, more mezcal-filled gig down in Oaxaca. As the exchange of culture flows, the previously limited cocktail scene is starting to blossom. 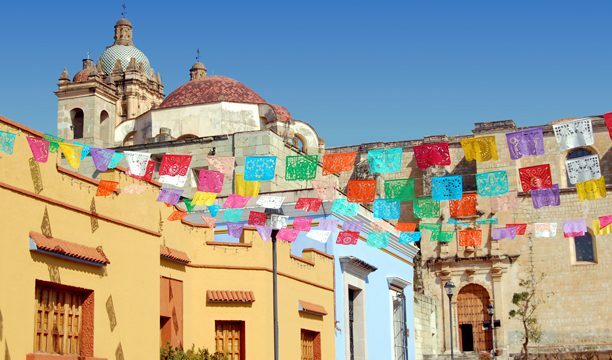 Trends from major cities across the globe are finding their way to Oaxaca more quickly, thanks to the growing international population of residents and frequent guests. Many of the old-guard mezcalerias still refuse to offer mixed drinks, staying faithful to their original vision. For now, the new and the old exist happily side by side, with no discernable shortage of eager imbibers. Click through the following pages to discover our pick of the top five bars in Oaxaca, Mexico.